Everyone loves a character meal at Disney. Even if you have teens, you know deep down they love it when a princess comes over to your table, regardless of the look on their face. A Disney World character meal can be one of the memories you are your kids may think back on for years. In Epcot, while there are more restaurants than at any other Disney theme park, there is a real lack of character meals, with only 2 offerings! The Garden Grill Restaurant (Land Pavilion) – Breakfast, lunch and dinner. The Chip ‘n Dale’s Harvest Feast features your best chipmunk friends Chip and Dale, along with their friends farmer Mickey and Pluto. 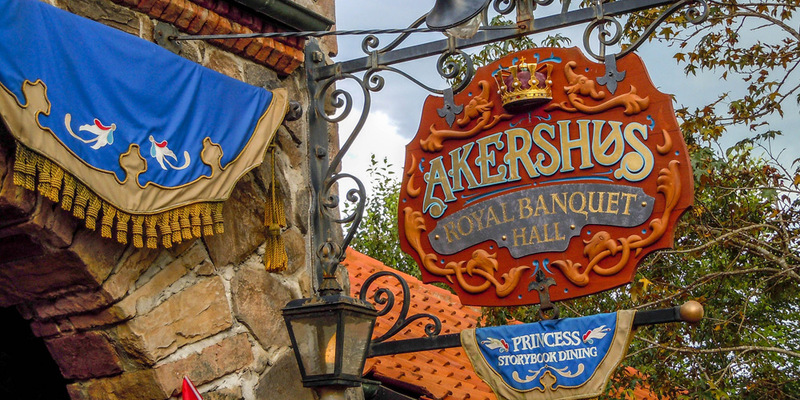 Akershus Royal Banquet Hall (Norway Pavilion) – Breakfast, lunch and dinner. Princess Storybook Dining features your favorite Disney princesses, including Snow White, Cinderella, Belle, Princess Aurora, Ariel and Mary Poppins, though most likely not all of those princesses will be in attendance, they have busy schedules after all. Cape May Cafe (Beach Club) – Breakfast only. I am including this on the list for you since the Beach Club is a short walk or boat ride away from the International Gateway in Epcot, so while not in Epcot, it is an option for most families visiting the park. Minnie’s Beach Bash Breakfast features Minnie and friends, including Mickey of course, as well as Goofy and others. A great way to see your favorite Disney characters in their beach attire. The Dis/dom choice for best Disney World Character Meal in Epcot? This one really isn’t close. While I really like the uniqueness of the Garden Grill, which rotates and gives you a view of Living with the Lane (my favorite Epcot ride), I think the Princess Storybook Dining in Akershus Royal Banquet Hall is a much better option for most people, including families with boys. Castle Akershus is beautiful inside, just a fantastic building, a great place to eat your meal. While Cinderella’s Royal Table in the Magic Kingdom is wonderful, if you happen to be on the Disney dining plan, it is also 2 table service credits per person, while the Princess Storybook Dining meals are only 1 per person, so basically half the price! Why pay twice as much to see Cinderella? New foods! Remember, this is the Norway pavilion, so you get a little bit of Norway with each meal. For lunch and dinner, the entrees are Norway themed. Don’t worry, you aren’t going to get stuck with a plate of pickled herring (unless you really want that), but you do get to choose Traditional Kjøttkake and Svinekotelett. Don’t worry, the princesses speak Norwegian and can translate for you. If you are a little afraid of trying new foods, stick with breakfast, you still get a little Norwegian starter, but the rest of the food is pretty traditional American fare. It is right next to the new Frozen ride, Frozen Ever After. While neither of the Frozen princesses appear at Princess Storybook Dining (yet), they are both just a short walk away. Please note, the Frozen Ever After attraction has not yet opened, but should open sometime in May, 2016. Is the Disney World Quick-Service Dining Plan Worth It? With the price increase of the Disney Dining plans yesterday, now is a good time to look at the Quick-Service dining plan, and whether it is worth it or not. Walt Disney World offers three different dining plans for guests who book a Magic Your Way package that includes your Disney resort and theme park passes. You can opt for no dining plan at all as well, though most people go with one of the three plans. The Quick-Service dining plan is the least expensive of the three plans, and includes two quick-service meals plus one snack per person per night, plus a resort refillable mug for each person. 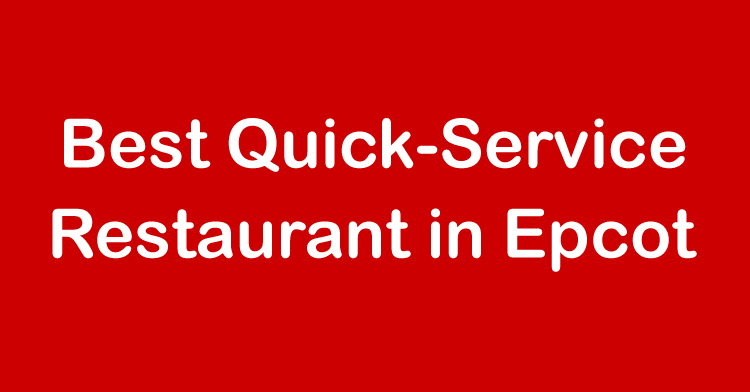 Quick-service meals are typically akin to fast food, so hamburgers, sandwiches, salads, etc. You walk up to the counter to order your food and take it to a table to eat. A meal includes an entree, side, dessert and drink, and can be used for breakfast, lunch or dinner inside or outside of the theme parks. Currently, the cost for the quick-service dining plan is $44.13 for adults and $19.04 for children (3 – 9 years old) per night of your stay. You must purchase a plan for your entire stay, and everyone in your party must purchase the same dining plan, or no plan at all. Let’s look at an average day for one adult and one child. That would cost $63.17, and include two quick-service meals for each person plus 2 snacks. We will leave the refillable mug out of the equation, as that only amounts to a dollar or two per night, depending on how long you stay. Lunch at Tangierine Cafe – Morocco – Adult lunch of Chicken and Lamb Shawarma Platter ($14,99), dessert ($3.99) and bottled water ($2.75). Child lunch of chicken nuggets ($8.99). With tax, you get a lunch total of about $32.75. Snack – Two Mickey Ice Cream Bars ($4.25 each). With tax, a total price of about $9.00. Dinner at The Electric Umbrella – Adult dinner of French Dip Burger ($10.99), a chocolate cupcake for dessert ($4.59) and Pineapple-Coconut Slushy for a drink ($3.99). Child dinner of Macaroni and Cheese ($5.99) and a brownie for dessert ($4.19). With tax, a total price of about $31.75. So, for the two meals and a snack I get a rough total price of about $73,00. About $10 more than what they paid for the dining plan. But is the quick-service dining plan worth it? With the example above, you do save money. The biggest benefit I try to explain to my clients is that with all the dining plans, everything is prepaid and budgeted, so you just show up and eat, no need to worry about the cost of meals, how much money to bring or trying to order the cheapest thing on the menu just to save money. Just enjoy, that is the idea of going to Disney World, isn’t it? While you do save money with the example, it really isn’t a ton of money. While the example is accurate, you may not necessarily order like that if you don’t have the dining plan. Not everyone has a dessert with lunch or dinner, so you end up ordering things that you may not normally include in your meal, negating the savings. So, is it worth it? My suggestion to all my clients who are considering the quick-service dining plan is: If you plan on dining this way at the parks, then yes, go for it. It may not save you a ton of money, but the peace of mind has value too. If you are planning on mixing a few table service meals in there as well, then this may not be the right plan for you.